It will become one of the two Leo 1A5s converted to Artillery Observation Vehicles, that were subsequently not ordered into production. So far there are 10 entries in the gallery, though three are duplcated entrants. If you haven't done this, please do so. Some photos do not have proof of start time in the photos. Please make sure you use a mobile/computer screen/newspaper/whatever to record this. Is there a particular procedure to upload images to the Kitmaker gallery for the campaign? I've tried twice and the images upload to god knows where. Got it, thanks. My images were too big to upload the first time. 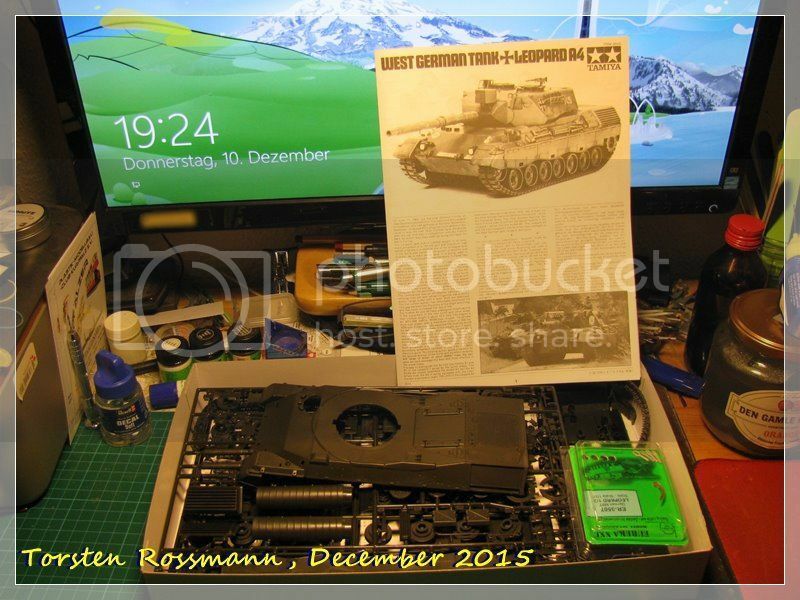 Shows that on December 6, 2015 I had grouped together the parts needed at this point to create a Leopard 1A2 CANADIAN "rent a tank" model. I saw it in the Tankograd book, then found a walkaround of it on Panzer Modell website. so the most difficult part when getting back into a project that I have laid down for awhile is getting back into the flow, and to remember where I was!. Anyways- gotta start somewhere. So I'll post images and try and explain the work along the way. So this is the the back end of the Italeri kit. I'm making some changes on the rear light housing to accommodate the SKP resin tail lights. In The last 24 hours or so I've received a subscription mail of BRANKVILL's post more than 100 times. I've unscribed post from the threat but they keep coming. Am I the only one and how do I deal with this? I have photos of it with most of the tools in place. The gun cleaning rack was removed completely for obvious reasons. I will mail you. No, but I don't use the "subscribe" function here. Sounds like it was a database flaw that failed to set a flag for "already emailed" or similar. Hopefully Jim S found & fixed it! He did indeed! He says he is testing a new code which should stop that bug from happening in the future. I have read Italeri is better but is the Tamiya kit that bad? The Tamiya kit is typical Tamiya for that period. Basically accurate and easy to build, motorisation holes, etc. Compared to the Italeri kit from the same time period, the Italian kit was light years ahead. It is still a very good model, a classic of it's time, despite the lacklustre modern releases from China. I have just started building Revell's new early Leopard so I think I will enter it into the Campaign alongside the 1A5DK I've already started. 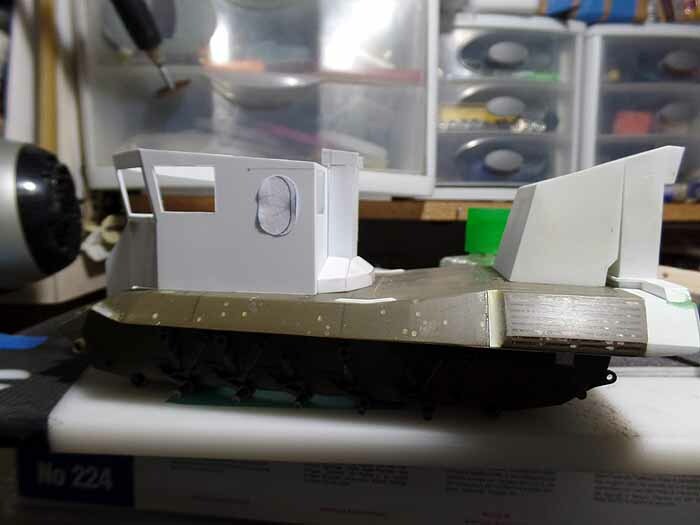 I need to prove that Leopard Workshop parts will work on the this kit - so it will serves two purposes. I actually started it two days ago and have already taken out the moulded-on rear deck grille and replaced it with the cast grating from the Meng kit - exact fit. Meng etch will go over the top. 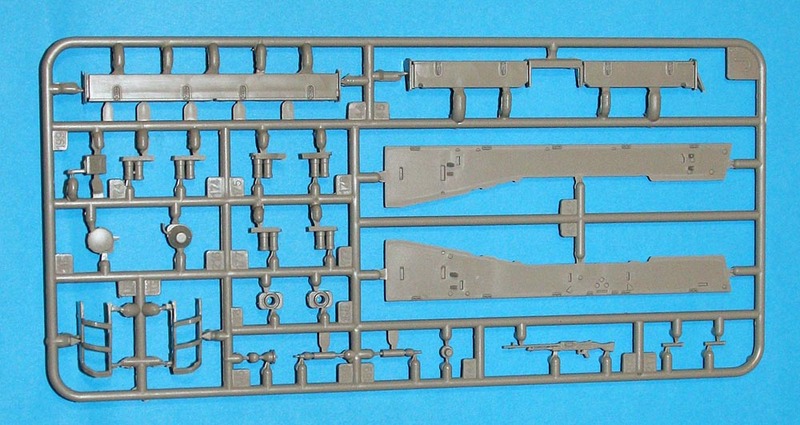 The sides will also get Leo Workshop grilles - though the kit ones are actually quite good, better than Meng or Takom. 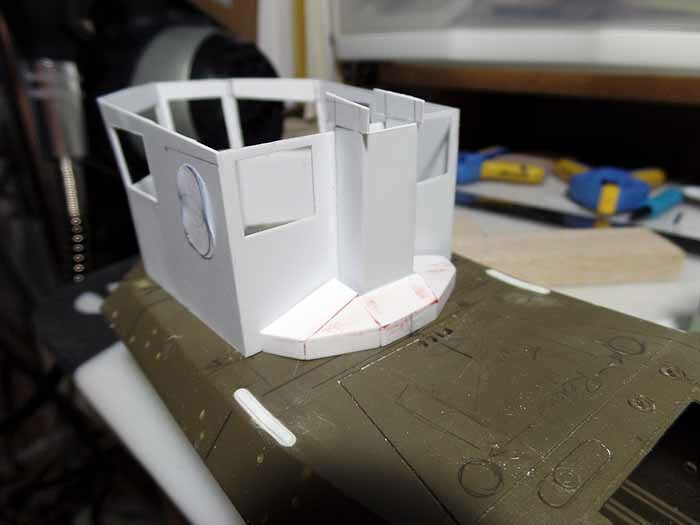 Working on the air system on the back of the cabin. The base is interesting..... 5 edges on the outside, going to 3 edges on the inside. Oddly, it ended up being easier than I was expecting. Which is not to say it didn't have its problems.... the vertical ducting is left over from an earlier attempt.... Earlier Attempt???? There were a couple earlier attempts, as you can see.... ??? However, it seems to be coming together and sort of looking like it should. One thing you might notice is that the grills on the rear sides of the hull are actually plated over. I know it looks like they haven't been touched, but the holes in them are actually filled with superglue. I don't know how many layers I put into them, but with some polishing that stuff turns clear like glass. 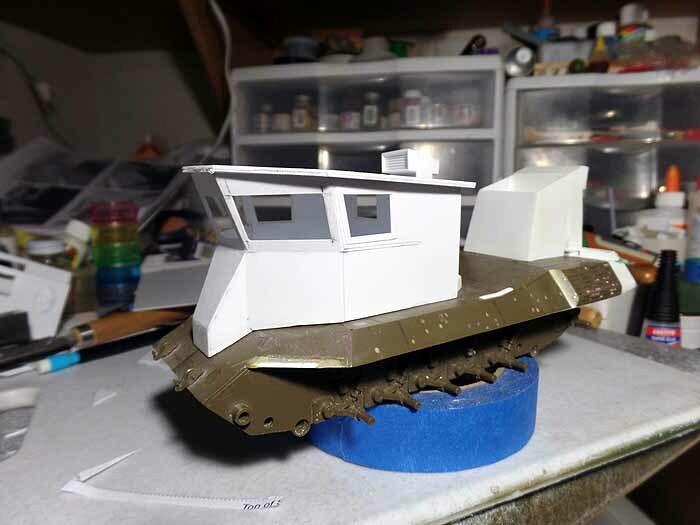 Going to give something a try..... if this works there should be a link to a video of the Dutch out on the beach that shows Titan (BARV number 4) pushing a landing craft off. Good luck with all your builds and happy modelling! Replacing the new Revell Leopard 1 suspension with Leopard Workshop Upgraded Suspension LW010 has proved possible without too many difficulties. Initially, I kept the Revell combined trailing arm/swing arm parts in place on the first and last stations to get the levels of the LW parts correct. 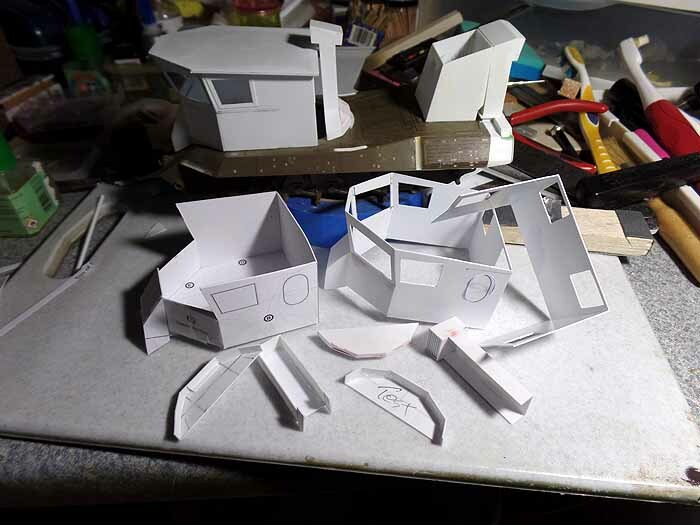 I hope you can see the difference between the Revell parts and the Workshop set. 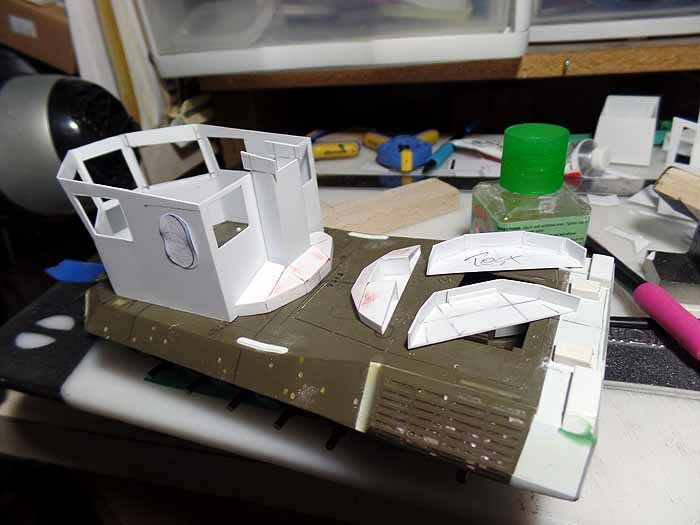 The duct work on the back of the cabin isn't sitting right up to the cabin as I have not cut the notch in the roof for it. 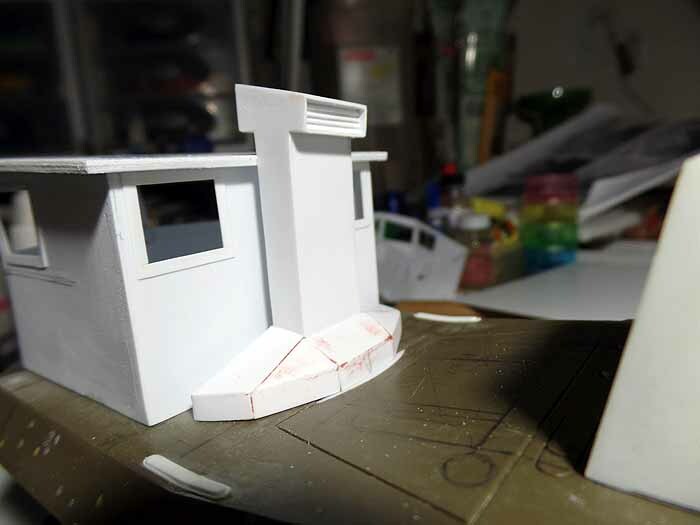 Although the cabin on the left with no windows is actually a paper one that I folded up to see if my drawings were even close. I have since discovered that at that point CLOSE is the key word. Now I get to do the handholds around the roof and cut the notches so that the duct work will sit properly. So, far there are some amazing Leopards in progress and I look forward to seeing your progress, and of course, the finished projects. Michael.... on the Revell kit, do you see any reason that they did the upper hull side panels like they did? Just wondering. Hi Bob. Your project is coming along nicely. You could all four of them at this rate:-) Does your wife know that you are using her chopping board? 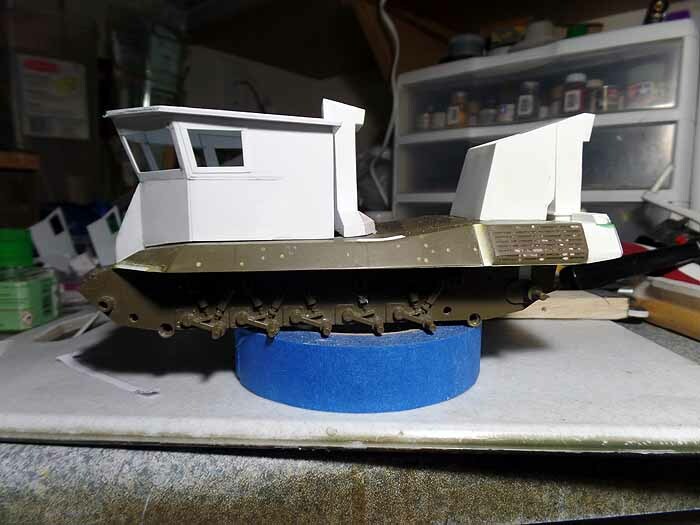 The reason for the separate Revell hull sides is for two alternative stowage arrangements - with external tool stowage or with hull-side tool bins on the Dutch version (and Belgian is perfectly possible if you don't follow the instructions). It saves a lot of filling of holes for whichever version. I think it's a clever idea. @Mike, how does the detail quality compare to the venerable Italeri kit? I haven't seen the new one in person yet. Doubt I'll have anything to post until after Xmas, as all my build time (and available space!) seems to be in high demand at the moment. Not sure about decking the halls, but right now I could happily deck the dude who invented shopping, wrapping, and decorating!